14 MB|48 Pages-Create an unlimited number of journal pages and covers! This product includes everything you need to create custom journals for your classroom! You will be able to customize a title, date, and 1 or 2 starter sentences for each journal page. 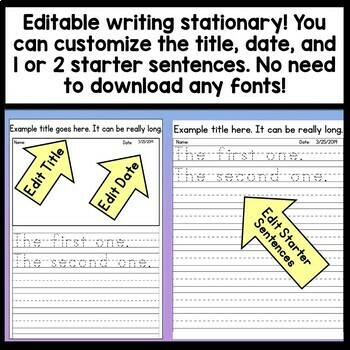 Simply enter a title, date, and 1 or 2 starter sentences onto page 1. As you type, the words will instantly be auto-filled onto the writing stationary. Every editable field is optional, so you only include what you want. You have the choice of portrait or landscape paper, with or without a picture box. 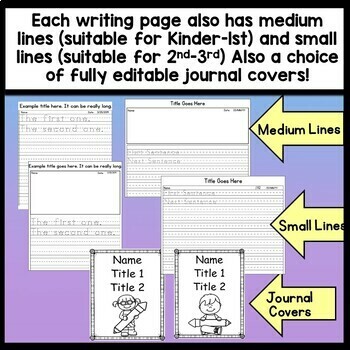 You also have the choice of medium dashed lined stationary (suited for Kinder or 1st grade) or small dashed line stationary (suited for 2nd or 3rd grade). 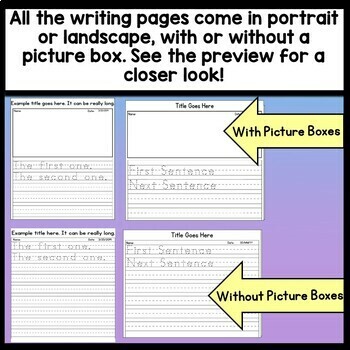 There is also a page of writing lines in landscape and portrait, in case your students need to write more on the back of their page. Also included are four (2 girl and 2 boy) fully editable journal covers! Please see the preview for a closer look at these stationary pages and covers. Since these pages are editable, you can create an endless number of custom journal pages! 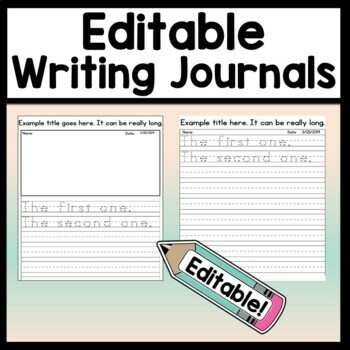 You can use these journals for daily writing, assigned writing prompts, assessments, reading responses, science journals, or anything else you can think of! Want to try an editable, auto-fill worksheet for yourself? Check out the FREE sight word game below! Do you need more editable activities? Check out the links below! 48 Pages-Create an unlimited number of journal pages and covers!